All Scripture is breathed out by God and profitable for teaching, for reproof, for correction, and for training in righteousness, that ﻿the man of God may be competent, ﻿equipped ﻿for every good work. As seen in the verse above, the Bible makes the claim to be God-breathed (Gr. theopneustos). If it is God-breathed, then it must be perfect, because God's way is perfect (Deut. 32:4). If it is able to be used to teach and for reproof, then it must be 100% truth and free from error and contradiction. Such is the foundation of this website. Not sure what's in the Bible or what its all about? It is a compilation of 66 Books written over 1500 years by 40+ authors. Its authors lived during the Egyptian, Assyrian, Babylonian, Persian, Greek and Roman empires. Its stories cover events from the beginning of the universe through its end and into eternity. Through all this, the message is clear and consistent: humans were made in the image of their Creator, they fell into sin and needed a Savior, God promised and sent His Son Jesus Christ to be that Savior, and all who trust in Him as their Savior will spend eternity with Him in heaven. This is evident in a few resources I put together. First, there is a timeline spreadsheet that lists every datable event in the Bible, fully referenced and utilizes a Young-Earth dating of the Creation events for simplicity. Next, there is a Chronological Walk Through the Bible (PDF) and even an easy-to-follow ﻿timeline version of this walkthrough ﻿(a 3-page PDF showing all 66 Books of the Bible in their historical context and the Scriptures laid out to show the unified story of God's redemption from beginning to end). Laid out this way it is easy to get the big picture of the Bible seeing how God moves through human history. Codex Leningradensis cover page. 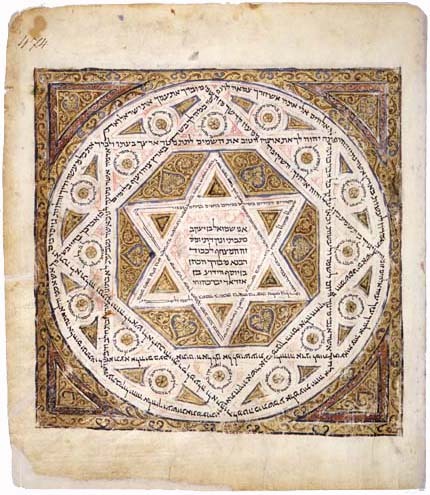 This codex is the oldest complete Hebrew Bible (c. 1008 AD). It currently resides in the National Library of Russia (image from Wikipedia). The Bible was obviously not written in English. The Old Testament was written in Hebrew and Aramaic. The most widely regarded Hebrew text we have today is the Biblia Hebraica Stuttgartensia. That is the text referenced on this site. 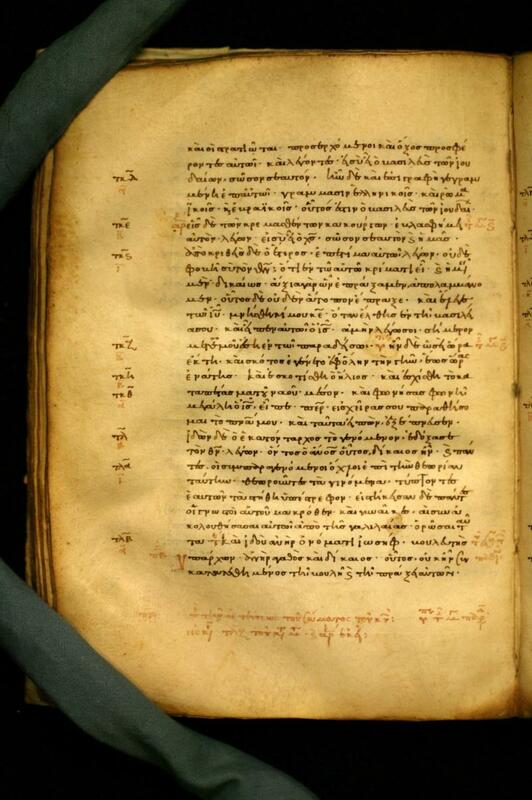 Codex Sinaiticus (4th Century AD). This codex was "discovered" in 1844 by Constantin von Tischendorf, 233 years after the King James Bible was published. This manuscript is older and closer to the original than many that the KJV translators used. This image shows Luke 11:2 and reads "pater hagiastheto to onoma sou. Elthato he basilia sou. Genetheto to thelema sou hos en ourano houto kai epi [tes] ges. Ton..." (lit. Father, hallowed be Your name. Let Your kingdom come. Let Your will be done, as in heaven, likewise also on [the] earth.) You may notice that this passage does not contain the familiar words "Our [Father] who art in heaven". Those words were introduced later as scribes sought to harmonize this passage with Matthew 6:9. Even this codex did not escape scribal interpolations. The words "Your will be done on earth as it is in heaven" is likely a later addition to the original as it does not appear in Codex Vaticanus and other early manuscripts (image from Wikipedia). The New Testament was written over a span of 50 years in the first century AD in the common language of koine Greek. Although there is some debate, many scholars put more weight on the older NT manuscripts. These are called the Alexandrian texts. Greek New Testaments such as the Nestle-Aland 27th edition (NA27) and the United Bible Society's (UBS) 4th edition utilize these older texts. On this site I will use primarily the NA27. 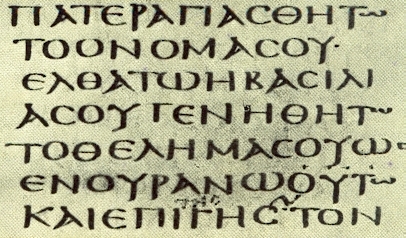 Codex 2882 is an example of a later Byzantine text. This miniscule dates from the 10th-11th centuries AD. This image shows Luke 23:36-51 and contains Jesus' conversation with the thief on the cross (image courtesy of the Center for the Study of New Testament Manuscripts). ﻿Many others favor the more numerous later manuscripts of the Byzantine family. The Majority Text is made up of mostly Byzantine-family manuscripts and was the basis for the King James English translation. As older manuscripts have been discovered, however, it was found that scribes had added quite a bit to the original text. There are no major doctrinal changes, but additions were made where scribes felt the original was unclear. An example of this is found in Matthew 25:13 where it says "Watch therefore, for you know neither the day nor the hour in which the Son of Man is coming" (NKJV). The Greek of the phrase "in which the Son of Man is coming" is not found in the earliest and best manuscripts. Therefore you will not see it in the English versions that translate from those texts (i.e. NASB, ESV). Most likely a scribe added the phrase so as to eliminate confusion and draw the reader's attention back to Matt. 24:44. In my opinion, the better texts favor the older, closer-to-the-original manuscripts. 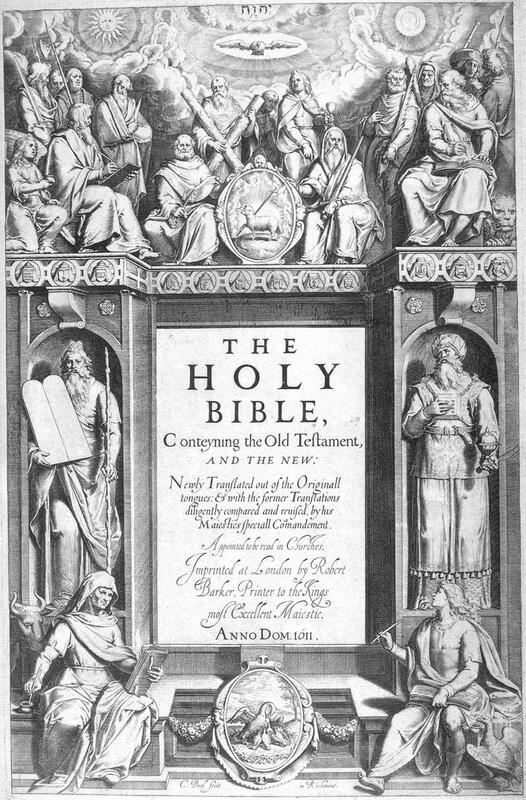 Title Page from the 1611 edition of the King James Version. The king James translators were very faithful to the original text. The only pitfall is that they only used the Majority Text from which to translate. 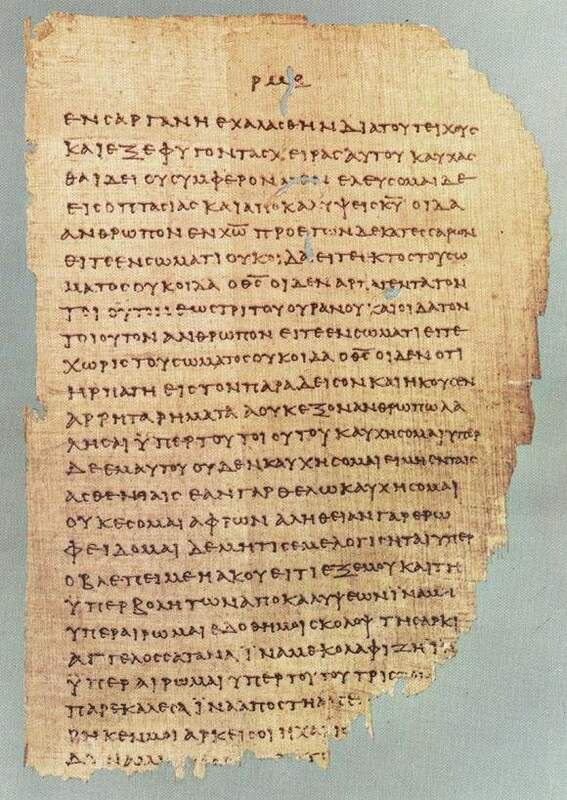 Since its publication, many older and better Greek manuscripts have been discovered, thus providing a more accurate text than the ones the KJV translators used (image from Wikipedia). So which is the best English translation to use? There are a few things to consider. First, what translation philosophy is preferred? A literal translation is best for Bible study but is difficult to read. A paraphrase is easy to read, but it loses much of the original wording. A best-of-both-worlds is an essentially-literal translation where the original integrity is kept for the most part and it is rendered in a readable English. The NKJV, ESV and NASB are essentially-literal translations. Second, what original text is preferred? Some such as the KJV and the NKJV use the Majority Text. Some such as the ESV, NLT and NASB favor the Alexandrian Text. Others like the NIV use an eclectic text where the translation committee determines what they think is the best from all the manuscript families. Finally, there may be a consideration for aesthetics. For example, do the translators lay it out in paragraph style or does each verse start its own line? Are the poetry sections indented or treated the same as narrative text? I have done an English translation comparison of the KJV, NKJV, NASB, ESV, NIV and NLT looking at 20 different New Testament passages. I graded them on grammatical, textual and theological bases. Basically, the essentially-literal ESV, NASB and NKJV are the three best English translations out there. For text critical reasons, I prefer the ESV and the NASB and therefore I use them mainly throughout this site. Here are some Bible study helps I have put together through the years which I hope you can find useful in your study of God's Word. Please feel free to download, use and distribute as you wish. ﻿Timeline﻿: A PDF showing a page of a simplified timeline of events and when the Books were written, and a page of expanded notes showing God's history of redemption unfold. A third page shows a map of the major biblical journeys. Exegetical Commentaries: Detailed exegetical notes on each of the Creation passages in the Bible. A few are available. These will take some time. Please be patient and keep checking back. Bible-Science Interpretation test: An Excel spreadsheet with 35 questions relevant to the discussion items on this site. Fill in the yellow blanks with your choice. My answers are on the About Me page. Theology 101 Quiz: Another multiple choice test to see what you know and believe about the Christian faith. The correct answers are on the About Me page. ﻿﻿Christmas Carol Theology﻿﻿: A resource that shows what we celebrate at Christmas, and how good some of our famous carols do at presenting the gospel. I also include a Bible study on "Hark! The Herald Angels Sing." Papyrus 46 showing 2Corinthians 11:33-12:9. This fragment dates from around 175-225AD and is one of the oldest surviving manuscripts available to date (image from Wikipedia). Is like looking at a coral reef from above the surface of the water. You have a good idea of what's there, but sometimes the intended meaning and context can be distorted. 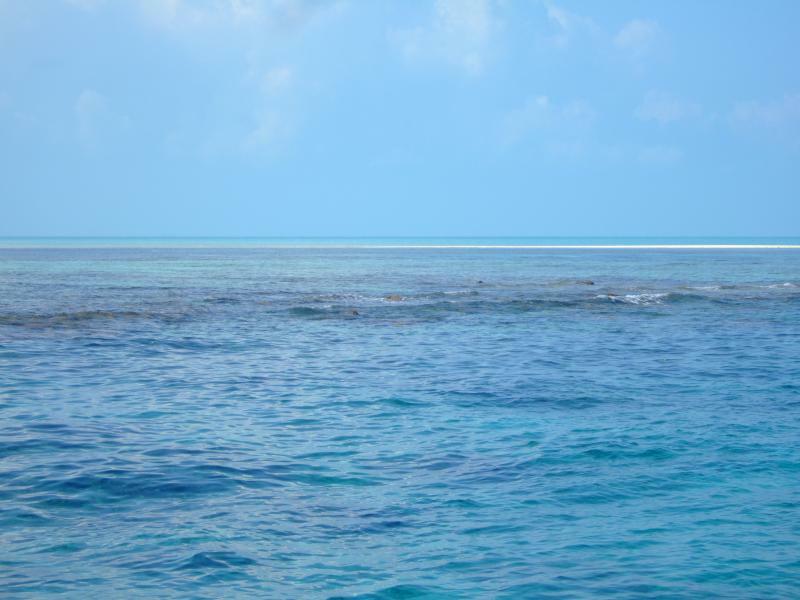 Is like seeing the coral reef as it truly is in all its depth and beauty. When you are equipped with the tools to dive deep, you will be amazed at what you discover.